Walking through the walls of the Orange County Convention Center, you hear these words and phrases over and over again. Perry. Immigration. Illegals. Tuition. Illegals. He didn’t do as well as he could have. Why? and why he had characterized the program’s critics as heartless. Obviously this is a huge deal with the Republican base. But I think Perry’s real problem is that Thursday’s debate badly shook up a GOP establishment that was pretty uneasy with him already. It’s not so much that Perry spoke in platitudes — all candidates do that — or that he muffed a few lines — any candidate can do that too — or even that his policy positions were unacceptable. Hell, he’ll figure out how to fight back on the tuition for illegal immigrants thing eventually, and he’ll get his foreign policy act together too. But there was a bigger problem: Perry looked like he didn’t think he needed to even care about any of that stuff. He muffed his attack lines because he hadn’t bothered to study them. He wasn’t prepared for the tuition fight because he figured that he could just repeat the same old explanations and flash his thousand-watt smile at the audience. He didn’t know what to say about Pakistan because he figured any sort of good ol’ boy BS would do. It always has before, after all. So he’s apparently spent the past month doing….nothing. That’s just way too Palinesque for the political pros. He looks like a guy who’s had such an easy time in Texas that he doesn’t really think he’s going to have to work for the nomination — or the presidency. Gentleman’s Cs have always been good enough, and he figures they’ll be good enough again. So he’s got nothing except a single set of sound bites for every occasion, and he’s not prepared to put in the time and effort it takes to sound even minimally ready for prime time when he’s taken out of his comfort zone. That’s a scary thought for Republicans. The economy is bad enough that Barack Obama is seriously vulnerable, but even with a bad economy he can beat somebody who’s convinced that his winning personality is enough to see him through any troubles. 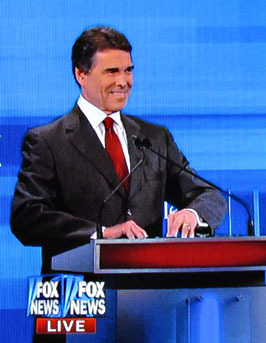 When Perry first announced his candidacy, he had the aura of a political animal willing to do whatever it takes to win. Now he looks like he’s willing to do anything except actually work hard. That’s a sure way to lose in November, and that’s why the GOP establishment is suddenly so nervous.